In the event of a landing the Commander’s authority is to have control of 50% of the available effort of the affiliated stations. This call takes authority over all other tasks. All aircraft not under army control are to attack enemy convoys at sea. If a landing is effected the main body of the convoys at sea may be attacked at places where the landing has been mad, depending on the situation at the time. Enemy forces caught at sea, and craft containing landing parties, are to be primary targets irrespective of enemy warships in the vicinity. If a landing has been affected and it is decided to attack beaches, enemy craft laying off the beaches and stores on them are to be primary targets. You must bear in mind that your forces may have to play a most important part in repelling an invasion of this country, and you should be prepared at short notice to divert your squadrons to the attack of the invading enemy force at points of departure and subsequently at sea, and points of landing in this country. To meet the threat of invasion twelve aircraft are to stand by (at each station) every morning at 20 minutes’ notice from twilight to sunrise. A plan to use every available aircraft in a last-ditch effort to repel a threatened German invasion was also devised, known as Operation Banquet. An Air Ministry meeting outlined a series of ambitious plans to make use of various aircraft in the event of an invasion, thus the AOC-in-C Training Command was ordered to plan to make the maximum practical number of aircraft available for operations. The overall plan was divided into a number of separate operations that could be enacted independently. Sub-groups of the plan, as envisaged, were: Training (Battle, Audax, Harvard, Hind etc. ), Transport (Harrow), 2 Group (Blenheim, Battle), Technical (Wallace) and 6 and 7 Groups (Whitley, Anson, Hereford). Aircraft allocated under Banquet would, in many cases, lack bombsights, armour for the protection of the crew, defensive guns and self-sealing fuel tanks. While these were to be fitted where possible, RAF instructions were very clear that no aircraft was to be considered unfit for want of such niceties. Anything that could fly and drop bombs would suffice. The air crew would be the experienced instructors as well as those students that had reached ‘a reasonably satisfactory standard of training’. Another proposed use for the Tiger was the ‘Paraslasher’; fitted with a scythe-like blade intended to cut parachutists’ canopies as they descended to earth. Flight tests proved the idea, but it was not officially adopted. There was also the ‘Human Crop-Sprayer’ version, which had a tank fitted in the front cockpit with powder dispensers located under the wings. The tank would be filled with an extremely poisonous insecticide and probably violating the terms of the Geneva Convention. It was intended that low flying aircraft would dust the German troops as they waded ashore. The Banquet Light strike force was to be employed in an Army co-operation role, which would likely mean being sent to bomb concentrations of airborne troops or soldiers landing on the beaches. They were to be based at advanced landing grounds around the country including Grangemouth, Inverness, Macmerry, York, Firbeck, Hooton, Hatfield, Snailwell, Bury St Edmunds, Sawbridgeworth, Gatwick, Odiham, Tilshead, Weston Zoyland. The intention was that the two-seater Tiger Moth bombers should be flown solo into an attack at low altitude until the enemy was identified and then climb to 800 feet and dive to 500 feet to release the bombs. Most of the pilots for Banquet Light were to be students who had not yet graduated. The scheme required that trainee pilots were introduced to bombing at an early stage in their instruction – just in case they needed to go into action immediately. Instructors were told to take every opportunity to carry out practice bombing. However, with no dummy bombs available, training exercises were carried out with the aircraft flown from the front cockpit by instructors and house bricks were thrown over the side from the rear cockpit. It was discovered that the bricks fell faster than a diving Tiger Moth and instructions were given to throw the bricks forcibly away from the aircraft. About 350 aircraft were available. This was not an insignificant force, but the Moths and their inexperienced pilots would have been very vulnerable to enemy aircraft and the plan was widely regarded as virtually suicidal. Other proposals included Lysanders fitted with twin 20 mm belly-cannon, and another fitted with a four-gun turret in the tail. Both modifications were made and the respective aircraft flew. There already existed a few cannon-armed Hurricanes and Spitfires, although these had proved problematical due to continuous gun stoppages. Undoubtedly, Harvard advanced trainers would have been made available, suitably equipped. By mid-summer, some 24 Masters had been converted to fighters by having the second seat removed along with some of the excessive cockpit glazing, and three. 303 Brownings installed in each wing. Practically everything that could fly would have been thrown into the battle. Consideration was also given to adapting civilian aircraft for Banquet Civil. However, the plan was not thought worthwhile and the idea was dropped. During the latter part of May, a number of Station Defence Flights were strengthened with the arrival of redundant Gladiators. Manston operated G Flight with K6970, K7928 and K8033; Andover received N5702; Gosport received K6149, K7898 and K7995; RAE Farnborough received K5200; and Prestwick formed a Fighter Flight with N5912 and N5514. Elsewhere, various Station Flights were formed, some with two or three Hurricanes, some with one or two Spitfires. Decoy airfields (known as K-sites) sprang up where cows had previously grazed, and often dummy aircraft, made of wood and fabric, appeared overnight. Even similarly-constructed hangars and other buildings would soon adorn the ‘airfield’. Many hundreds of dummy ‘aircraft’ were produced, representing Spitfires, Hurricanes, Blenheims and Wellingtons amongst other types. Elsewhere similar sites were prepared to bamboozle German night bombers, being fields equipped with gooseneck flares, known as Q-sites, to mimic operational airfields. Those in the know, however, were quietly confident that the one great advantage the RAF had over the Luftwaffe was its embryonic radar system, particularly as its operators gained experience; in fact, the first successful use of radar by ground control to guide an interceptor had occurred on 12 May, when a He111 from 2./LG1 was intercepted near Vlissingen by Blenheim P4834 of A&AEE from Martlesham Heath, crewed by Flt Lt Chris Smith and AC A. Newton. The bomber was damaged and its gunner, Gfr Walter Jenderny, wounded. After the evacuation from Dunkerque [Dunkirk] the pressure on the Fighter Command became less intense, but it by no means disappeared. Hard fighting took place along the coast from Calais to Le Havre to cover the successive evacuations from that coast. Then the centre of gravity shifted to Cherbourg and its neighbourhood, and the Battle of Britain followed on without any appreciable opportunity to rest and reform the units which had borne the brunt of the fighting. As has been explained above, few squadrons were fresh and intact when the Battle began. No sufficient respite has been granted since the conclusion of the Dunkerque fighting to rest the squadrons which had not left the Fighter Command and to rebuild those which had undergone the ordeal of fighting from aerodromes in northern France. These last had been driven from aerodrome to aerodrome, able only to aim at self-preservation from almost continuous attack by bombers and fighters; they were desperately weary and had lost the greater part of their equipment, since aircraft which were unserviceable only from slight defects had to be abandoned. At the insistence of Prime Minister Churchill, the Air Ministry now asked the Admiralty for the loan of 50 FAA fighter pilots to partially make good losses suffered in France and over Dunkirk. 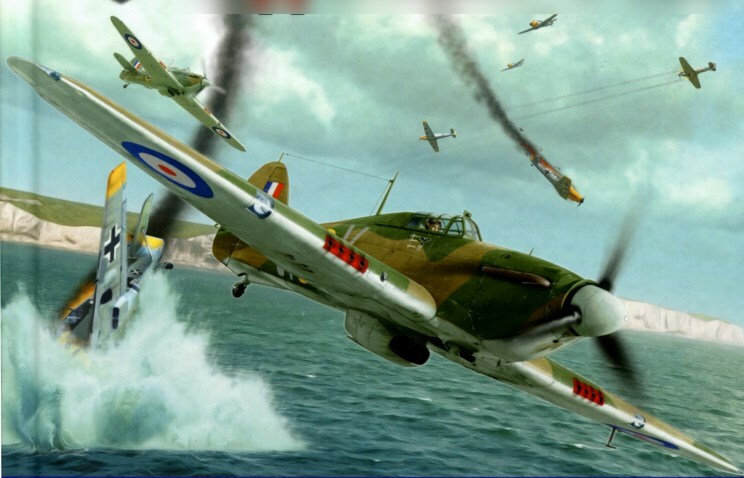 Fighter Command reported its pilot losses as 284 killed, missing or prisoners of war, plus 63 wounded or injured during May and June including those who became casualties due to flying accidents. The Admiralty responded by placing 804 (Sea Gladiators) and newly formed 808 Squadrons under Fighter Command control, although the former remained at Hatston for local defence while the latter, formed on 1 July, was under training at RNAS Worthy Down with a few Skuas, and a dozen Fulmars that were just being introduced into service. The measures that were taken to increase pilot output during June and July chiefly concerned Flying Training Command. But the earliest important accession of strength, and the more welcome because it came so shortly after the heavy losses in France, was the result of an agreement with the Admiralty for the loan of Fleet Air Arm pilots. The matter was first discussed in the War Cabinet as the Dunkirk evacuation drew to a close; and the Prime Minister instructed the Air and Naval staffs to see whether any naval pilots could be transferred to Fighter Command. He had in mind an allocation of fifty pilots by the end of June. On 6 June the Admiralty issued instructions for the release of 45 pilots (including seven [sic] RAFVR pilots who had been serving with the Fleet Air Arm), half of them trained, half semi-trained. The Air Ministry, however, asked for half the output of the two flying training schools serving the Fleet Air Arm to be allotted to the RAF, beginning with thirty pilots by the end of June. The Admiralty could not agree on the grounds that the casualties amongst their pilots in April and May had been nearly four times as large as postulated and that, in addition, the war with Italy meant more work for the Fleet Air Arm than had been visualised earlier. Thirty more pilots – making sixty-eight naval pilots in all – were loaned during June; but ten were recalled early in July for service in the Mediterranean; and later in the month the First Lord informed the Secretary of State for Air that no further attachments would be possible. The loans, however, were timely and, considering the Admiralty’s difficulties, substantial. As it transpired, neither 804 or 808 Squadrons were required for operational duties per se, the FAA’s major contribution being the 27 pilots seconded to RAF squadrons during the coming weeks: Sub-Lt(A) A. G. Blake joined 19 Squadron; Sub-Lt(A) G. G. R. Bulmer to 32 Squadron; Sub-Lts(A) J. H. C. Sykes, F. Dawson-Paul and G. B. Pudney to 64 Squadron; Sub-Lt(A) D. A. Hutchison and T/ Sub-Lt(A) I. J. Wallace to 74 Squadron; Mid(A) M. A. Birrell to 79 Squadron; SubLts(A) D. H. Richards, R. W. M. Walsh, T. V. Worrall and Mid(A) P. R. J. Gilbert to 111 Squadron; Sub-Lts(A) I. H. Kestin and F. A. Smith to 145 Squadron; SubLt(A) H. W. Beggs and Mid(A) O. M. Wightman to 151 Squadron; Sub-Lts(A) H. G. K. Bramah, D. M. Jeram and W. J. M. Moss to 213 Squadron; Sub-Lt(A) J. C. Carpenter to 229 Squadron; Sub-Lt(A)s R. J. Cork, R. E. Gardner and Mid(A) P. J. Patterson to 242 Squadron; Mid(A) R. F. Bryant to 245 Squadron; Sub-Lt(A) H. laF. Greenshields to 266 Squadron; and Mid(A) P. L. Lennard to 501 Squadron. In addition, Sub-Lt(A) David Marks had been killed while flying a Hurricane of 7 OTU in preparation for his transfer to an RAF squadron. It should be noted that most of these pilots were not considered operational and were sent to RAF OTUs initially for conversion training and a rapid course in fighter tactics. Some did not reach squadrons until late August/early September. Others lasted only a few days and were sent away for further training. FAA observers, in particular, were occasionally seconded to Bomber and Coastal Commands during this period, and even earlier. With the build-up of invasion barges and other craft in the harbours at Calais and Boulogne, these immediately became a priority target not only for the FAA but also Battle light bombers of Bomber Command, particularly 103, 142 and 150 Squadrons. To assist the RAF crews a number of newly qualified FAA pilots and observers were attached to these units. Others were seconded to fly heavy bombers, mainly Whitleys involved in over-sea flying. Eight RAFVR fighter pilots who had been seconded to the FAA and were currently undergoing a refresher fighter course at Donibristle with 769(T) Squadron were released to return to Fighter Command; these being Sgt D. K. Ashton to 32 Squadron; Sgt D. Ayres to 600 Squadron; Sgt H. W. Ayre to 266 Squadron; Sgt O. R. Bowerman to 222 Squadron; Sgt E. N. Kelsey to 611 Squadron; Sgt R. O’Donnell to 19 Squadron; Sgt J. Pickering to 64 Squadron; Sgt W. J. Timms to 43 Squadron. Two who had deliberately failed the FAA course – Sgt F. N. Robertson and New Zealander Sgt R. J. Hyde – were already flying Spitfires with 66 Squadron. Another former RN pilot, Plt Off A. R. H. Barton (who had been trained to fly Swordfish) arrived to posting to 32 Squadron following a brief conversion course. This entry was posted in Air Warfare, Battle, British, Germany by MSW. Bookmark the permalink.